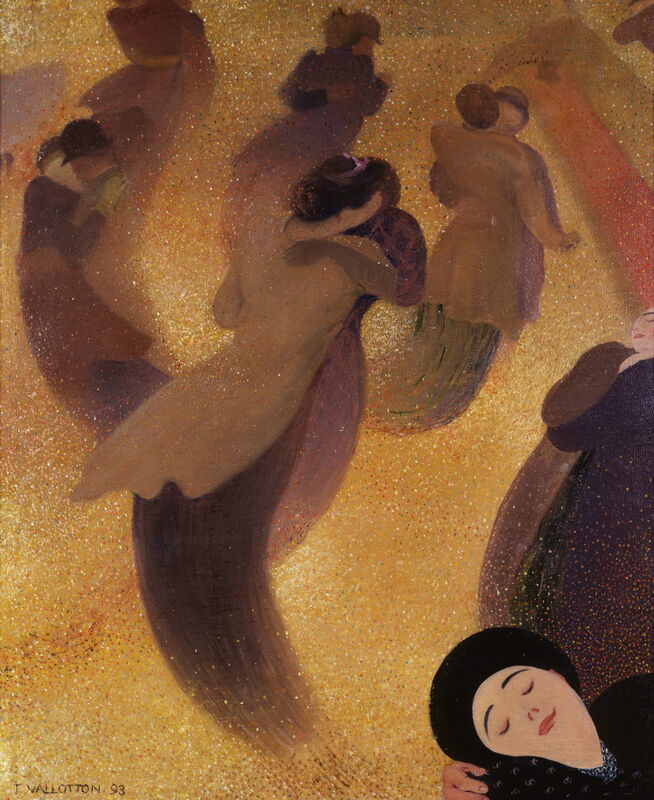 Félix Vallotton (1865–1925), Waltz (1893), oil on canvas, 61 x 50 cm, Musée d’art moderne André-Malraux (MuMa), Le Havre, France. Wikimedia Commons. 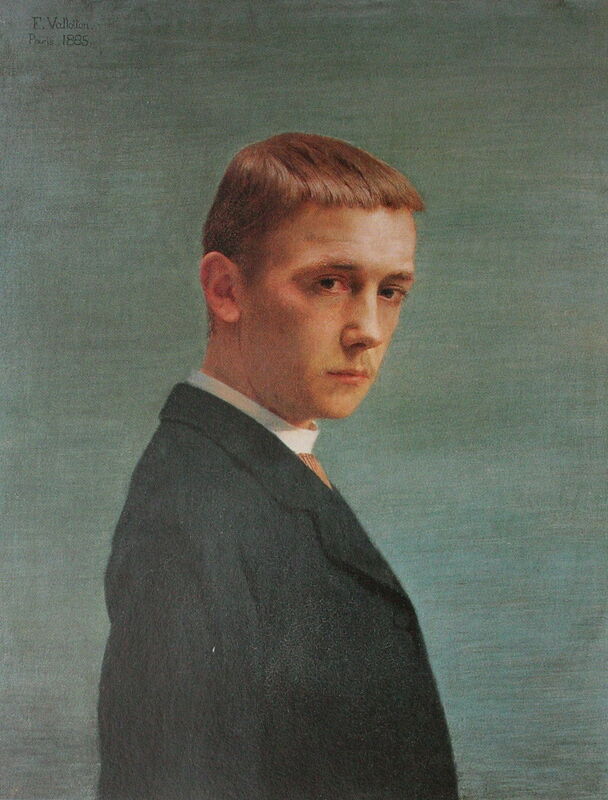 Félix Vallotton (1865–1925), Self-portrait at 20 (1885), oil on canvas, 70 x 55 cm, Musée cantonal des beaux-arts, Lausanne, Switzerland. Wikimedia Commons. Among those early works is this Self-portrait at 20 from 1885. 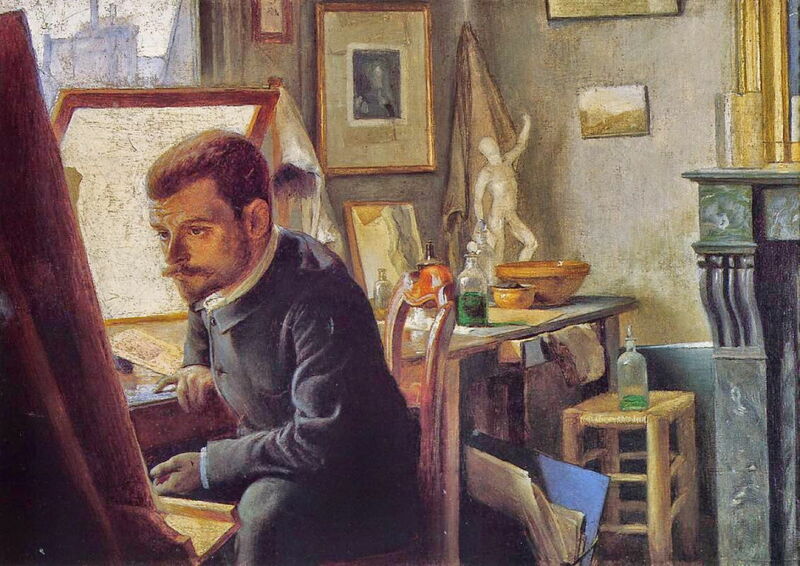 Félix Vallotton (1865–1925), Félix Jasinski in his Printmaking Studio (1887), further details not known. Wikimedia Commons. In the late 1880s he learned to make prints, apparently through his friendship with the Polish artist in his painting of Félix Jasinski in his Printmaking Studio from 1887. Although Jasinski was successful at the time, his work now seems to have been largely forgotten. Vallotton soon became fascinated by Japanese woodcuts, including ukiyo-e which had become so popular in the late nineteenth century. He collected them, and in 1891 started making his own woodcuts. Félix Vallotton (1865–1925), The Sick Girl (1892), oil on canvas, 74 x 100 cm, Private collection. Wikimedia Commons. At this time, his painting was decidedly Naturalist in subject and style. The Sick Girl from 1892 uses a theme which was popular with Naturalist painters throughout the 1880s and into the 1890s. His model was his muse and lover Hélène Chatenay, whom he had met in 1889. They remained a couple until the late 1890s, and in 1907 she was tragically killed by a car. Vallotton’s highly detailed realism here extends to showpiece surface reflections from the glassware and polished wood, but he curiously obscures the face of the young woman in her sickbed by reversing the bed’s normal orientation. Many of his apparently humdrum interiors have unusual twists such as this, which add strangeness which was later to be formally exploited in Surrealism. 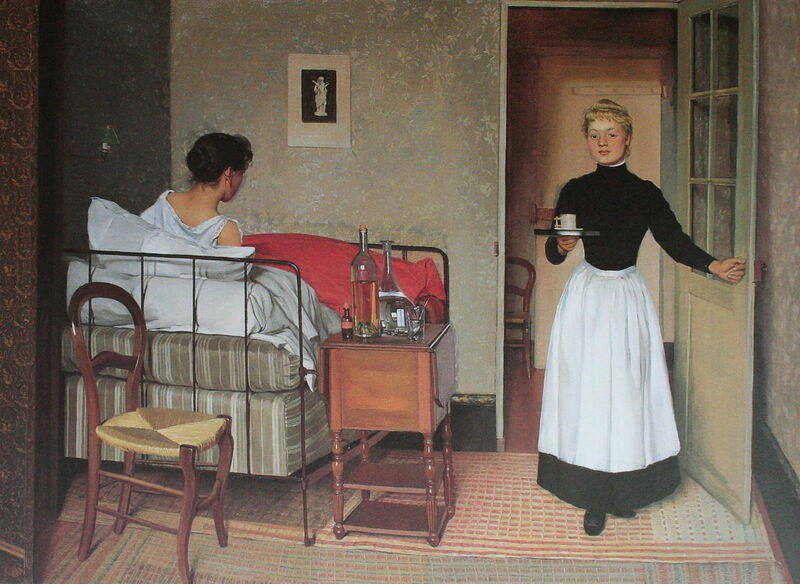 Another odd feature in this painting is that the maid who has just entered the room appears to be heading towards the viewer, and isn’t even looking towards her patient. Félix Vallotton (1865–1925), La Cuisinière au fourneau (The Cook at the Stove) (1892), oil on panel, 33 x 41 cm, Private collection. Wikimedia Commons. 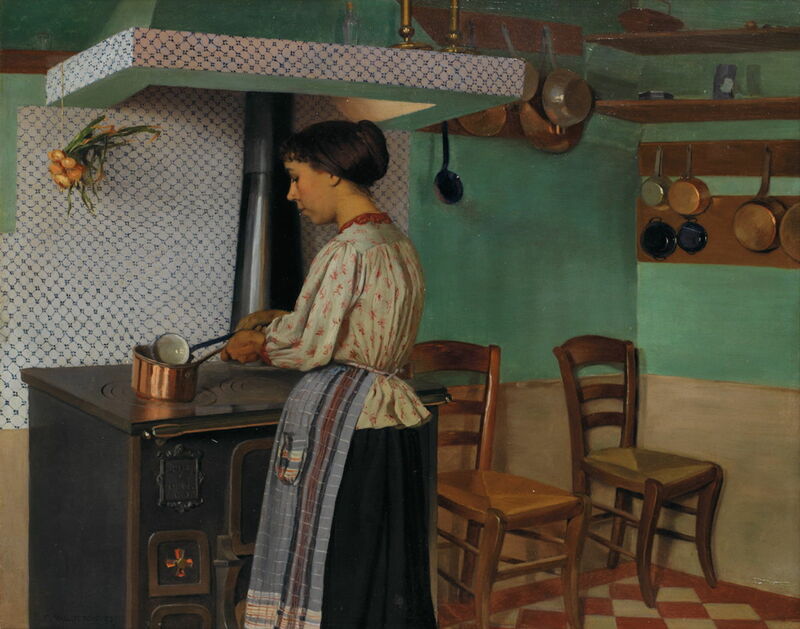 La Cuisinière au fourneau, or The Cook at the Stove from 1892 is another domestic genre scene drawn from Naturalism, and features Hélène Chatenay as Vallotton’s model. She stands at the solid-top range in a kitchen strangely almost devoid of the one thing that kitchens are for: food. The only edible item visible is a bunch of onions suspended in mid-air. Everything – the chairs, pots and pans, and the range itself – is spotless as if they have never been used, and appear unnatural. In 1892, Vallotton made lifelong friendships with key members of the Nabis, including Pierre Bonnard, Ker-Xavier Roussel, Maurice Denis, and Édouard Vuillard. Because of his Swiss origins, he was dubbed the Foreign Nabi. 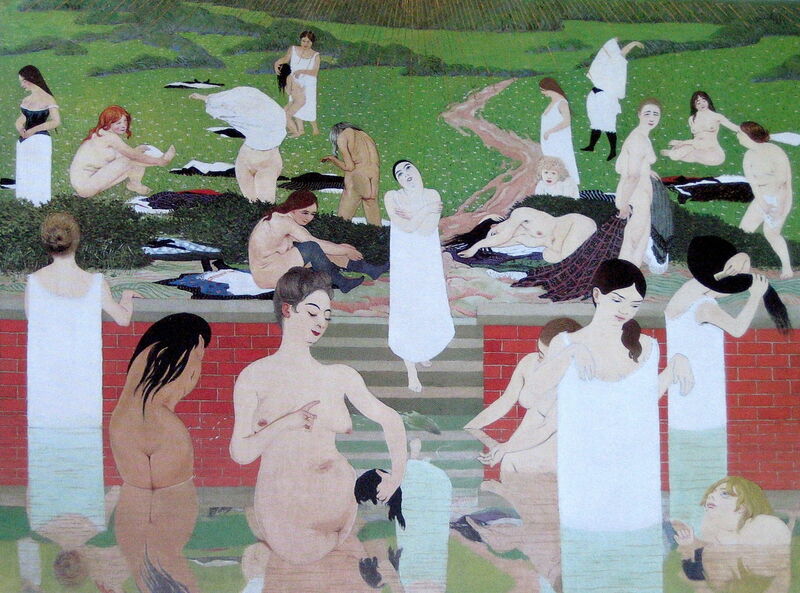 Félix Vallotton (1865–1925), Bathing on a Summer Evening (1892-93), oil on canvas, 97 x 131 cm, Kunsthaus Zürich, Zürich, Switzerland. Wikimedia Commons. His most overtly Nabi painting is Bathing on a Summer Evening from 1892-93. These flattened and stylised figures representing women of all ages have been applied like collage to a background reminiscent of some of Ferdinand Hodler’s alpine meadows. In 1893, Vallotton painted his remarkable Waltz, on which he appears to have sprinkled thousands of multi-coloured dots which give its surface a fine sparkle. Couples sweep across an unseen dance floor, embraced in a lover’s waltz, with just one of their faces clearly visible. Félix Vallotton (1865–1925), Street Scene in Paris (1895), gouache and oil on cardboard, 35.9 x 29.5 cm, Metropolitan Museum of Art, New York, NY. Wikimedia Commons. 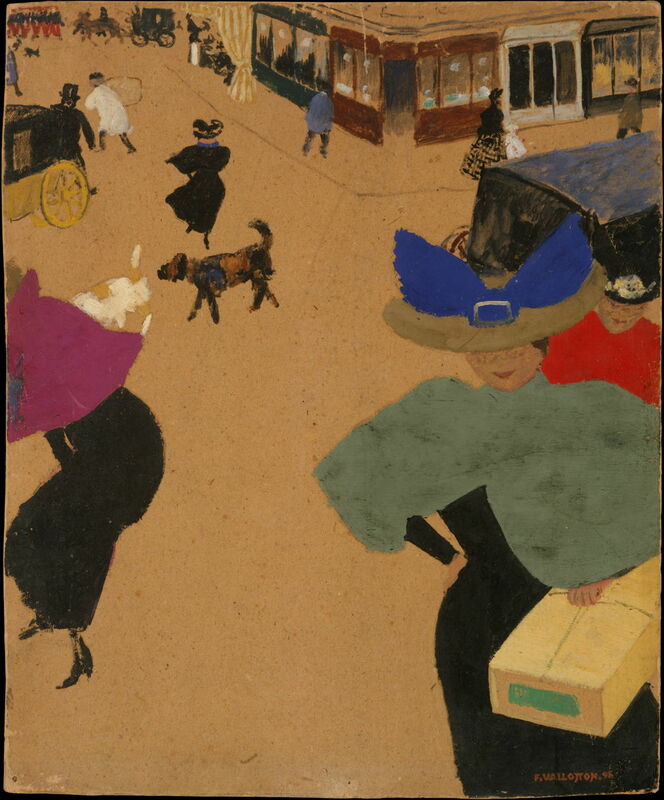 Unlike Pierre Bonnard, Vallotton doesn’t appear to have painted many views of the city itself, but this Street Scene in Paris from 1895 shows more Nabi style and some overlap with Bonnard’s contemporary motifs, even down to the dog wandering in the middle of the road. 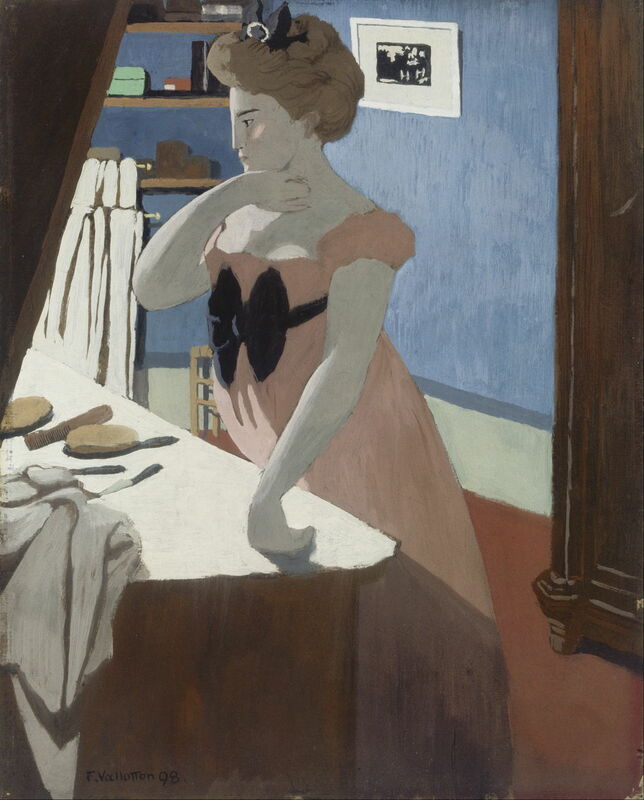 Félix Vallotton (1865–1925), Misia at Her Dressing Table (1898), distemper on cardboard, 36 x 29 cm, Musée d’Orsay, Paris. Wikimedia Commons. Like the other Nabis, Vallotton became involved with the Natanson brothers, and their magazine Revue Blanche published a series of ten of his prints of interiors in 1898. He provides us with a glimpse into the private life of Misia Natanson (as she was at the time) in his Misia at Her Dressing Table (1898), which again shows Nabi style. Félix Vallotton (1865–1925), The Ball (1899), oil on cardboard on wood, 48 x 61 cm, Musée d’Orsay, Paris. Wikimedia Commons. 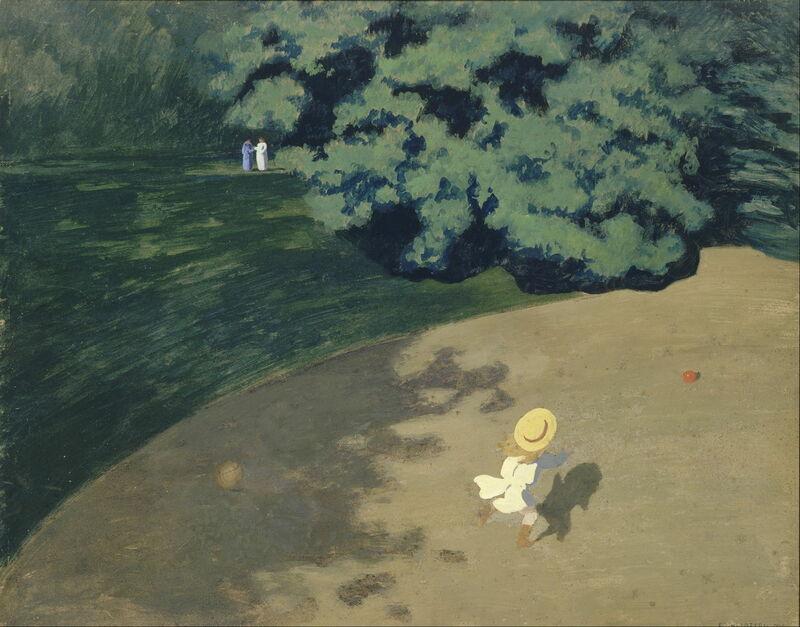 As Vallotton moved on from his brief affair with the Nabis, and the group itself disintegrated, he experimented with unusual points of view, as in The Ball from 1899. A young girl is chasing her red ball, as two women talk in the distance. This is seen from mid-air above the girl, forming a simple but compelling motif with an air of mystery. Félix Vallotton (1865–1925), On Dieppe Beach (1899), oil on cardboard, 42 x 48 cm, Private collection. Wikimedia Commons. On Dieppe Beach from 1899 reduces a scene on the north coast of France as only a printmaker could, to discrete forms filled with colour: the textured sand, sea, sky, and the simplified shapes of the three figures with a parasol. 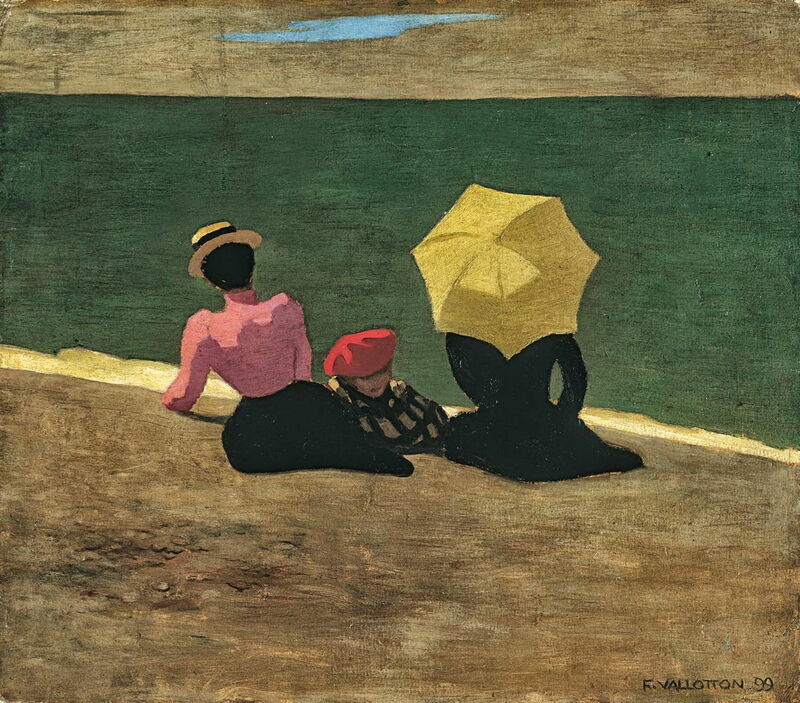 In 1899, Vallotton married Gabrielle Rodrigues-Henriques, a rich young widow who already had three children. The following year, he was granted French citizenship. In the early years of the new century, he was to concentrate on painting more strange motifs. Posted in General, Life, Painting and tagged Bonnard, Hodler, Lefebvre, Nabis, painting, Surrealism, Vallotton. Bookmark the permalink.